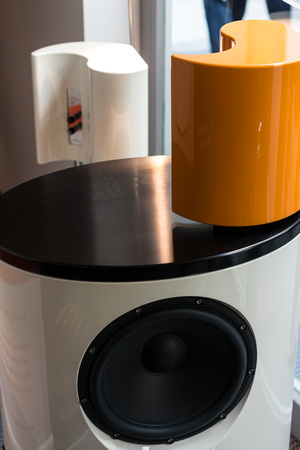 As most of you already know, I think Munich High End is the most exciting consumer audio show in the world. Nothing else comes close to matching it for variety and fun. And this year no other show came close to matching it for sound quality, which was not just generally excellent (there were, of course, exceptions), but also in several instances as good as I’ve heard at a trade event. I don’t know what manufacturers were doing differently this May in those MOC “rooms”—not really rooms, but partitioned-off spaces along a glassed-in corridor—but many of them were getting a level of fidelity that would put a grin on any music lover’s face. While the quality of sound might have changed for the better, the crowds of attendees from all over Deutschland, and all over the globe, remained the same. As I’ve said before, those doomsayers who predict that this hobby will die off with the last of the boomer generation really ought to come to the MOC. Year in and year out, they’ll find the same masses of young men, women, and children thronging the halls and atria, as if the show were a kind of Disneyland, and the pursuit of high-end audio a recreation suitable for the entire family. Even a dour old codger like me can’t help feeling thrilled, knowing that the same weird gravitation that in my long-ago youth drew me to the absolute sound is still exerting its pull on new generations of listeners. Munich is a giant show, even larger (up 16% in attendance, over 500 exhibitors) this year than last. If you imagine a collision between CEDIA and CES you’ll get an idea of how big it is—with huge bottom floors full of booths and static product displays, and layer-caked top ones lined with those glassed-in “rooms” where music is played. Because of the show’s size there is no way to hear or report on every system being demo'd, particularly in a vast category like loudspeakers. One does one’s best but one is, after all, one, and the show is many. With apologies, then, for those rooms and manufacturers I missed, here are my highlights from this year’s Munich High End. 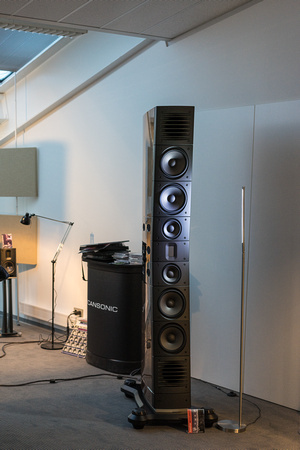 After its disappointing debut a few weeks ago at AXPONA Chicago, Magico’s $229,000 flagship—the massive, aluminum-enclosed, five-driver, four-way Q7 Mk II—performed a volte-face in München, where it sounded, well, great. 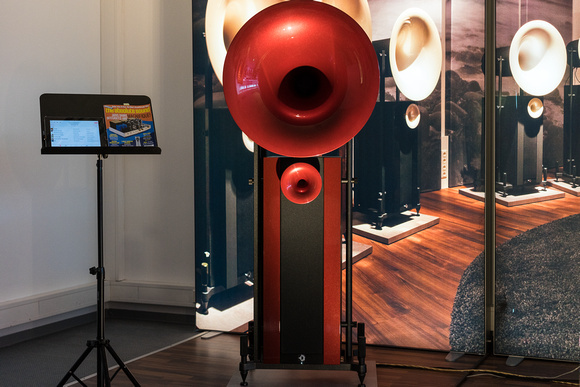 Indeed, this may have been the best I’ve ever heard a Magico loudspeaker sound at a trade show—which is to say that this may have been the best I’ve ever heard any loudspeaker sound at a trade show. Sensationally beautiful, powerful, and lifelike on vocals and those wonderful brass and Hammond organ accents from Leonard Cohen’s “Slow,” the speaker was equally gorgeous, majestic, and fool-you realistic on Rachmaninoff’s Symphonic Dances and Jaco Pastorius’ system-bustingly dynamic and wildly busy punk-jazz romp “Crisis” (off Rhino’s 180-gram Record Store Day release Anthology). Like Alon Wolf and Yair Tamman’s limited-production M-Project speaker (and for some of the same reasons—the new diamond-coated beryllium tweeter and improved graphene-carbon midrange driver both speakers share), the new Q7 boasts a marmoreal solidity in the bass and power range and an upper-midrange/treble sweetness that have eluded previous Qs, and yet the Q7 Mk II (like the M-Project) somehow achieves this more concert-hall-like balance without sucking out the presence and brilliance ranges and without sacrificing the speed, resolution, and transparency that Magicos are famous for. I hate to let the cat out of the bag this early in a show report, but as wonderful as the other contenders in Munich were (and, as noted, there were a whole bunch of wonderful speakers at the MOC), nothing else was quite this top-to-bottom beautiful, powerful, detailed, and lifelike. Congratulations to Wolf and Tammam, to Cyrill Hammer who provided the superb Soulution electronics (the 701 monoblock amplifiers, the 725 preamplifier, the 760 DAC, the brand-new 755 phonostage) and the one-off turntable/tonearm (which he may soon be manufacturing), to the folks at Vovox for the excellent cabling, and to Joe Lavrencik for his (IMO) incomparable Critical Mass Maxxum amp and equipment stands. Take a collective bow, gents. 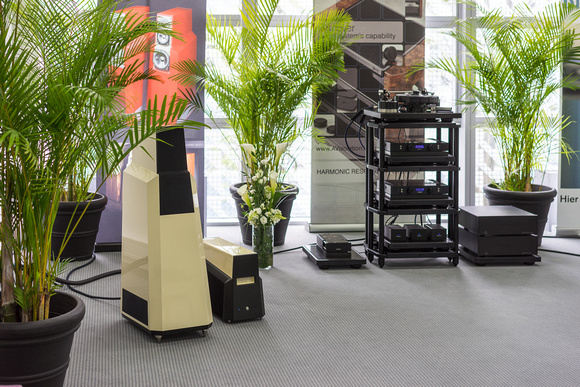 Your exhibit was a good as hi-fi gets—at a show, or anywhere else. As fabulous as the Magico Q7s sounded, the $62k Vandersteen Model 7 MkII, with six carbon-fiber drivers and built-in powered sub, driven by Vandersteen’s own oil-cooled M7-HPA amplifiers ran them a close second. 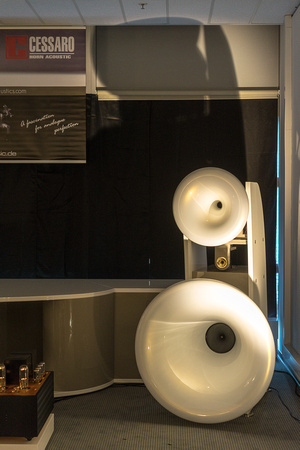 Here is another instance of a loudspeaker doing a dramatic about-face, as the Vandersteen flagships sounded considerably less than wonderful at CES in Vegas, although in this case they were being driven by virtually the same electronics. On my speaker-busting Jaco Pastorius album, the Vandys were a bit more aggressive on top than the Magicos, but their bottom octaves and midrange were just as phenomenally lifelike (though a mite leaner in color)—through-the-floor low end on Pastorius’ bass guitar, goosebump-raising presence and detail on Leonard Cohen’s deadpan voice. Though the two presentations were fundamentally different (the Vandys being more “top down,” the Magicos more “bottom up” in balance), they were both persuasively realistic. 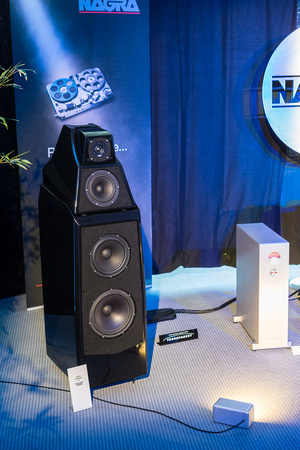 At any other event, the Vandersteen Model 7 MkII would’ve been a shoe-in for Best of Show. At Munich 2015, it’ll have to settle for runner-up, though when you consider that it costs roughly one-quarter of what the Magico costs, that’s a mighty strong second place finish. Third place in the sonic sweeepstakes goes to these gorgeous four-box, quarter-of-a-million dollar numbers from Stenheim of Switzerland. 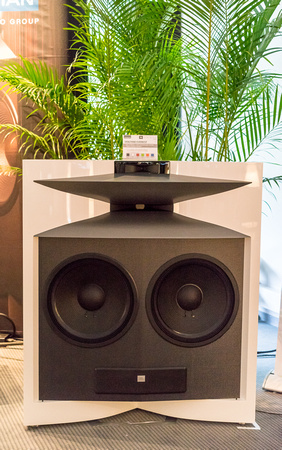 Each of the Reference Statement’s aluminum-bodied main towers houses eight drivers (two 13** woofers, four 6.5** midrange drivers, two tweeters, and two ribbon supertweeters) arrayed in a D’Appolito configuration, with a nifty motorized panel in the center that allows you to change the angle of the MTM section. The separate aluminum woofer towers house three 13** woofers, powered by three 1200W monoblock amps. 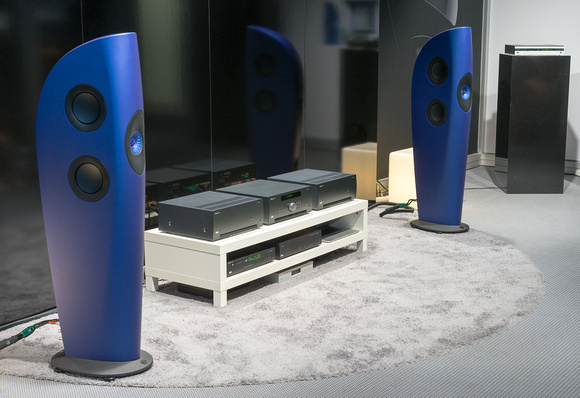 In the system at Munich, the main towers were driven by CH Precision electronics (the M1 monoblock amplifier and L1 preamplifier) and sourced by Audio Consulting’s R-evolution Minima turntable and blimp-shaped Meteor phonostage. Once again, in a normal year, this all-Swiss system would have easily won the laurels, but in 2015 it was up against the Magico and the Vandersteen, and as gorgeous, powerful, and very finely detailed as it was on my Leonard Cohen and Jaco Pastorius albums and on a Speaker’s Corner reissue of Elektra that I picked up at the show, it gave up a little soundstage spaciousness to both of these others. 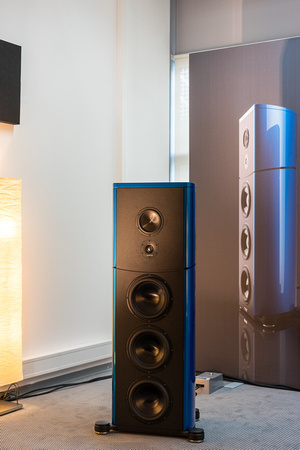 In balance, the Stenheims are very much like the Magico Q7 MkII—rich, robust, and concert-hall-like. And powered by the superb CH Precision and Audio Consulting electronics and sources, they give nothing away in speed or resolution, though they are, perhaps, not quite as full and authoritative in the power range as the Soulution-powered Magicos. At this level of excellence, it seems a little unfair, even to me, to pick nits when a speaker is so manifestly superior, but I’m afraid nit-picking is really the only way to judge among systems this closely matched in quality. On a different day, in a different venue, the sonic shoe might well be on the other foot. This Austrian speaker, from Salzburg, no less, isn’t yet distributed in the U.S. But, trust me, it deserves to be. 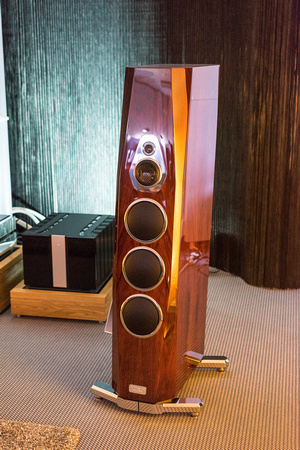 A three-way floorstander in a sealed MDF cabinet that uses steel-ball-filled interior chambers for damping and features four powered 9** carbon-fiber woofers, one 6** magnesium-cone midrange driver, and a coaxially mounted 1** beryllium tweeter, the $69k Audiodata Master One sounded exceptional on everything I played through it, from The Wall to Leonard Cohen to Rachmaninoff. Possessed of much the same marmoreal solidity as the Magico Q7 Mk II and the Stenheim, it also boasted, startling dynamics, an exceptional midrange, and a sweet-as-sugar treble, with great resolution and ambience retrieval, to boot. One of the many delightful surprises of the show, the Master One was driven by Symphonic Line electronics and sourced by a wonderful sounding Revolution Double turntable with diamond bearing. Speaking of surprises! I could’ve picked many other speakers to fill this final slot, but I simply wasn’t expecting this modest floorstander from the venerable British firm whose name was once synonymous with “loudspeaker” to produce such high-quality sonics. Using a dual-concentric driver (8** mid/woof and 1** tweeter) coupled to an auxiliary 8** mid/woof—a configuration that Tannoy made famous decades ago—in a “dual-cavity-coupled” reflex enclosure, the $2600 XT 8F produced an astoundingly robust, full-bodied sound. Oh, its bass might’ve been a tad overfull, but it still had impressive definition, while its midrange timbre and transient response were excellent by any measure. Driven by Rega’s top-line electronics, the XT 8F was shockingly good for the money. Thus its inclusion in this illustrious company. This terrific two-way mini-monitor with the witty, comma-like shape has impressed me since its introduction last year. Now equipped with a silken-sounding SEAS diamond tweeter, this €18k mini could easily have been (and probably should have been) one of my Five Most Significant Exhibits. But since it was coupled with Crystal Cable’s striking new €10k CCDB (Crystal Cable Deep Bass) subwoofer, introduced at this year’s show, I saved it for auspicious debuts. No one in this industry has a more playfully elegant sense of style than Crystal’s Gabi Rijnveld, while her celebrated husband, Edwin, ranks among the world’s finest audio engineers. Together this couple has created many beautiful sounding and beautifully designed components—none better, IMO, than this sat/sub combo, powered by Crystal’s equally fashionable Cube integrated amp. One of my colleagues thought the sound of this combo rivaled that of the Magico Q7 Mk II in the midband—and it was indeed stunningly open, boxless, detailed, and realistic on vocals, though (naturally) a bit reduced in image size, as all two-ways are! Blessed with that extraordinarily lifelike and densely colored mid, among the sweetest treble I’ve heard from a diamond tweeter, and quite staggeringly good, powerful and deep-reaching bass, the Minissimo Diamond/CCDB sub is a satellite/system of extremely high style and superb sonics. A great debut for Crystal Cable. 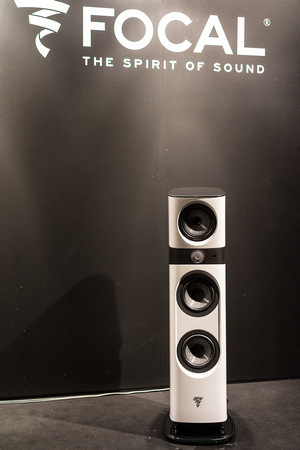 Focal introduced its clever new Sopra Series loudspeakers, the No.1 two-way and No.2 four-driver three-way floorstander, all equipped with Focal’s ingenious Neutral Inductance Circuit (which makes use of a Faraday ring to eliminate eddy currents), Tuned Mass Damper (which employs a separate mass that oscillates in opposition to the resonance frequency of the driver to control its breakup modes), and Infinite Horn Loading (a damped horn-like chamber that dissipates the rearwave energy of Focal’s beryllium tweeter). In addition to these new driver technologies, Focal uses a new enclosure for the Sopra Series that articulates around an polyurethane central section, allowing the top (midrange) and bottom (woofer) cabinets to be inclined for better “focus time” à la Focal’s top-line Utopia speakers. Although I’m sure that the Sopra Series speakers will prove winners, coming as they do from one of the most fully integrated, engineering-driven, ceaselessly inventive companies in the high end, I can’t honestly say that the No.2 sounded particularly good in the giant room in which it was ensconced. Though it had very good extension in the bass with lovely low-end color as well, it was being played unpleasantly loudly, which added bite and aggressiveness to piano in the upper mids and treble. Last year the Zellaton Reference bowled me over with its realism on small-scale recordings of voice, violin, and piano. This year, with its new, five-driver, three-way $129,950 Reference Mk II flagship driven by BFA electronics, not so much. Said to use revised versions of the incredibly lightweight aluminum foil/rigid-foam sandwich diaphragms originally developed by Emil Podszus back in the 1930s, with improved crossovers and caps, and stands designed to better drain energy from its enclosure, the Mk II version of the Reference was specifically re-engineered to improve power handling and dynamics on large-scale music and to add more weight and color in the power range—areas in which Zellatons have traditionally been weak at lifelike volumes. And indeed the speakers did sound markedly richer and fuller on Lennie’s “Slow.” But “Slow” is a sparsely orchestrated number with limited dynamics. On a blockbuster like Jaco Pastorius’ “Crisis” the new Zellatons didn’t fare nearly as well—generating next to no impact and extension on Pastorius’ deep-reachimg bass guitar. I’m told that there were problems with the amplifiers in this room on the day that I heard the Zells that caused the loss of dynamic range and bass extension, so it may be that the Ref Mk IIs are far better than they showed. I hope so, because at lower volumes they still do many things incomparably well. Magico introduced its new top-of-the-S-line, five-driver, three-way $58k S7 driven by Constellation Performance Series electronics. Like the outstanding Q7 Mk II, the S7 incorporates some of the advances that Magico showcased in its M-Project loudspeaker, including less expensive versions of that speaker’s diamond-coated beryllium tweeter and graphene midrange driver. In the digital-only system at Munich, the S7, which is still “a work in progress” according to Alon Wolf, showed fairly well. Rickie Lee Jones’ “Danny's All-Star Joint” sounded swell, though not quite as full in the bass as and a bit brighter on top than what I'm used to from the (much more costly) M-Project and Raidho D-5 in my home systems. Nor did the S7/Constellation system have quite the same marmoreal solidity in the power range as the Q7/Soulution. You could hear the difference in the brass choruses, which didn't have all the weight and color they should have. That said, this is a better speaker than previous Ss—more extended and more alive, with a big sound and big soundstage. I look forward to hearing it again. 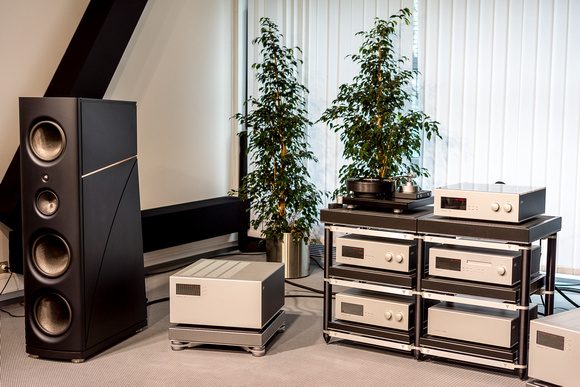 Goebel High End showed its €175k Epoque Reference loudspeaker with bending wave driver and Epoque Baroque sub, both driven by Analog Domain Artemis monoblock amps. Goebel achieved quite an excellent blend between its unconventional mid/tweet and dynamic woofs, producing a sound that was very delicate and detailed at lower levels but a bit shouty at higher ones. 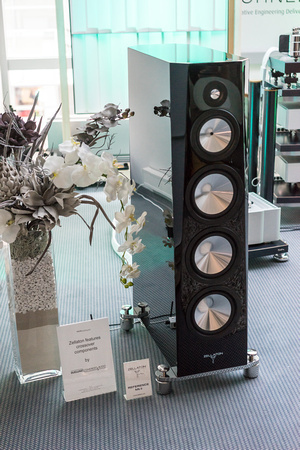 Perfect8 Technologies offered up an improved version of its smaller floorstander, the €100k Point Mk III, which combines a true ribbon and custom woofers, both mounted on a tempered glass plate that is itself perched on a glass-enclosed push-push subwoofer. Driven by Ypsilon electronics and sourced by a Bergmann turntable, the Points displayed their usual wonderful, boxless openness, along with better bass than in years past. On “Ain’t No Cure for Love” they were very damn realistic on Lennie’s voice and on the gorgeous voices of his backup singers. Ditto on “Slow,” where they also showed fabulous articulation on synth and Hammond organ. Kind of the opposite paradigm to a dynamic speaker like a Magico, the Points sound like what they are: near-boxless dipoles. Like a planar, they are capable of incredible breathy detail, but also like a planar they lack a bit of power-range weight, giving them a top-down balance. This was another speaker that easily could have made my Five Most Significant list. Gauder Acustik demo’d its gorgeous Berlina RC-9 multiway with Accuton ceramic and diamond drivers in a Gauder’s stacked “rib construction” enclosure. Driven by AVM electronics the RC-9 produced a rich lovely sound that was light years removed from the sound of ceramic drivers of years past. There was no chalkiness, no strain, no brightness. Oh there may have been a bit of room-induced boom on big bass guitar, and while cymbals were good they weren’t quite as airy or as freestanding as they were via the Perfect8 and Vandersteen. Then again, this was a digital-only room and both of the others were analog. Avantgarde Acoustics is now offering a built-in parametric digital controller designed by Thomas Holm in the bass modules of each of its speakers, with provisions for exactly adjusting the sound to your room. The new horn-loaded Duo with Holm-adjusted bass module sounded quite remarkably "of a piece"—a bit rolled on top perhaps but pretty damn coherent at levels no other kind of speaker can quite manage. And, yes, the bass was good. Living Voice demo’d its gorgeously manufactured and finished, near-million-dollar Vox Olympian horn system, driven, as it was last year, by a bunch of equally expensive single-ended tube electronics from Kondo and KSL. As a digital source was being used when I listened to the Vox, who the hell knows what the speaker really sounds like? It definitely had superb transient response, and no horn colorations. It didn’t sound particularly real on Ali Farka Touré’s voice, but, good Lord, what it did with Ry Cooder's guitar! Anyone shopping for a speaker and electronics in this price segment isn’t going to need my advice, anyway. The MartinLogan Montis electrostatic hybrid and Balanced Force 210 sub were being displayed with Moon electronics, once again setting up a fascinating contrast with the superb dynamic, horn, omni, and planar speakers also at the show. 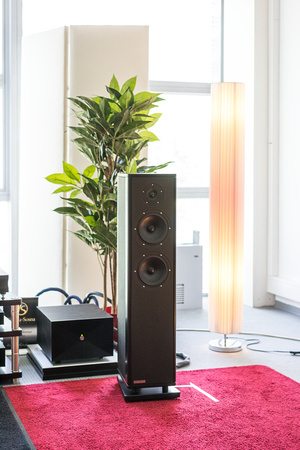 Here is an electrostatic hybrid with the boxless openness of a dipole—an extremely natural freestanding presentation with superb presence and resolution of texture, but without the immediacy of the horns or the marmoreal richness and solidity of cones. Arguably this was just as realistic a presentation as that of those others—certainly fabulous on voices—and extraordinarily detailed, but on the piano from “Famous Blue Raincoat” I got something similar to what I heard with the Cessaro horn speaker, in the sense that the initial transient was superb (and in this case I heard a bit more tone color, too), but the power range solidity of something like the Magico Q7 Mk II wasn’t there. So...what to say? I couldn’t, in all honesty, not call this a realistic presentation, but somehow it was incomplete—as they all are, frankly. The Revel Ultima2 Salon2 four-way dynamic floorstander, driven by Mark Levinson electronics, produced a nice lively sound that possessed some of the boxless openness of a dipole, with a lithe balance that was not ultra-dense in color, and excellent speed that was not, say, on a horn level, but still better than good. If this speaker were ice cream it would be a straight vanilla without an extra dollop of cream—delicious but not unduly rich or memorable. The KEF Blade Two coincident driver multiway driven by Arcam FMJ electronics sounded quite open albeit a bit nasal in the mids and tubby in the bass, where it slightly lagged behind the mids and treble in speed and definition on pipe organ. It was not a sound I was crazy about despite its openness. 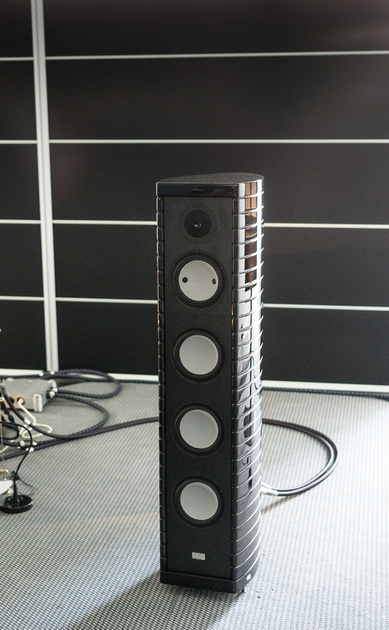 The €160k Tidal Akira multiway has a passive radiator array on back that is user adjustable to suit your room and a 5** diamond mid/woofer with 7mm excursion (a joint project of Tidal and Accuton). This single midrange driver crosses over from the active woofers at 150Hz and covers the entire range up to 6kHz, where it passes the baton to the diamond tweeter. In other words, it is very nearly a single driver speaker. And it has the purity of same. Very fast, very delicate, very clear on tubular bells, percussion, and wood blocks with just the slightest bit of diamond tweet glare on the very top, but also with simply extraordinary timbre and resolution in the mids. An outstanding floorstander. At €15k apiece Amadeus Audio’s Philharmonia self-powered (two Class D amps), two-way active monitor is a pricey little item. Housed in a stacked white birch-ply enclosure that sits on a dedicated black pedestal, it makes a striking visual impression. Very high in sensitivity and output the Philharmonia was intended for studio use but is now being released as a home loudspeaker. Though it was impossible to tell much about how it sounded in the open space of the gigantic exhibit hall where it was being demo’d, it seemed to have excellent bass extension for a two-way. Rosso Fiorentino’s €2850 2.5-way Elba floorstander, driven by Thrax, wired by Kubala-Sosna, and sourced by Bergmann, had very good presence and naturalness on voice. 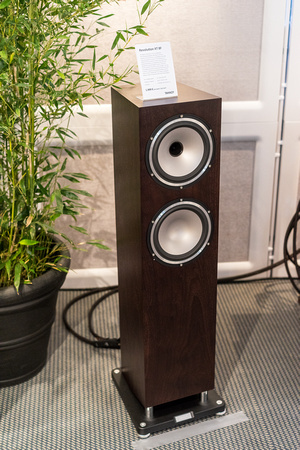 This was one of the few small floorstanders I’ve heard that sounded quite a bit better at louder volumes than lower ones, with excellent resolution in the bass. My notes read: “BOS for price!” So you’ll gather I liked it. The Vienna Acoustics Liszt driven by Vincent electronics made a warm, relaxed, well balanced, and attractive (albeit not particularly hard-hitting) sound on a digital version of “Baby Wants to Boogie and Daddy wants to Rock ’n’ Roll.” The VAs might not have been the showiest speakers, but they were extremely natural and listenable on Ry Cooder’s “Better Go Home, Girl” and “Little Sister” from Bop Till You Drop. 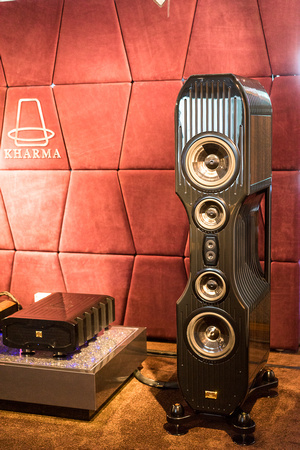 Kharma’s $173k Exquisite Midi Grand multiway with diamond tweeters and new carbon drivers, was being driven by Kharma electronics and sourced by dCS in an all-digital room. The Beethoven Fifth was quite impressively majestic, but flat and DG-digital-sounding, which can’t be blamed on the speakers, of course. The Midi Grands were very powerful, detailed, and dynamic, but, as was the case with the MBL X-Tremes, I don’t think they had enough room to fully stretch out. Still and all, this is a very good loudspeaker. 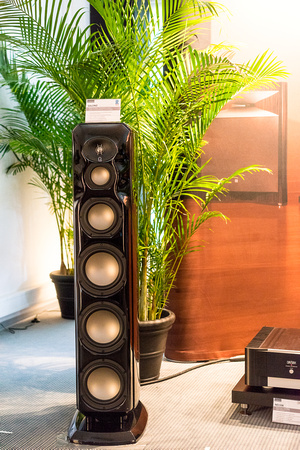 Speaking of very good loudspeakers, the $260k five-driver, four-way Estelon Extreme, which had rather underperformed at its introduction at this year’s CES, sounded positively fantastic driven (not coincidentally) by Soulution’s 7 Series electronics. What gave the speaker its cachet at CES was its nifty, V-shaped, motorized mid/tweet panel, which could be raised or lowered vis-à-vis its side-mounted woofers to accommodate room acoustics. 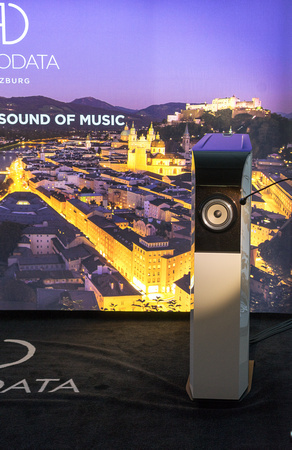 What gave it its cachet in Munich was its sound—simply glorious density of tone color top-to-bottom with none of the lightish, washed-out bass and power range that I heard at its Vegas intro. In fact, this speaker was so good in Munich—and sounded so entirely improved over its opening night—that I almost put it in Auspicious Debuts. I probably should’ve put it in the Five Most Significant section: The Estelon Extreme is a truly great loudspeaker when properly driven. 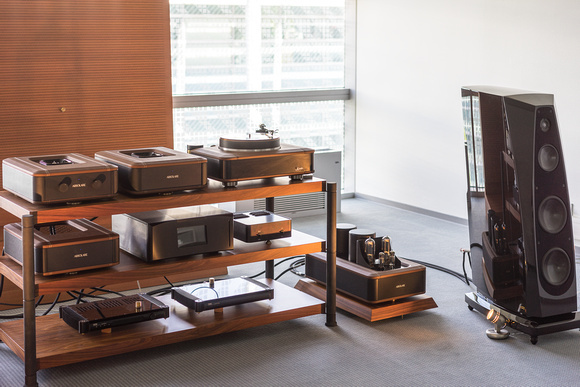 Rockport’s four-driver, three-way Avior floorstander was being demo’d with Absolare’s superb electronics and turntable. The presentation was, as it’s been several times before in the past, first-rate: fast, dark, rich, full-bodied, and extremely finely detailed. Lennie’s “Slow” sounded incredibly spacious, with remarkable depth and resolution, and slightly recessive mids that I found very attractive (and that only added to stage depth). Another great exhibit. The four-driver, three-way Wilson Alexia, driven by Nagra electronics, showed very damn well driven by Nagra electronics. Following a very nice intro by Ken Kessler, who dj’d bits and pieces of favorite non-audiophile recordings, the sound was outstanding. Bass might have been just a little tubby, but not objectionable so, the midrange was lovely, with excellent reproduction of voice, a warm balance, and (as with the Rockport) a little, sonically attractive recession in mids. This was probably the best presentation after Magicio, Vandersteen, Stenheim, Audiodata, Tidal, and Estelon. JBL showcased its $74k dd67000 Everest horn loudspeaker driven by Levinson new No.536 monoblock amplifier. This is simply (and famously) a terrific transducer, with no horn coloration—just a dark rich coherent presentation with superior articulation, great bass, lifelike presence, and incomparable dynamic range. The Everest may not have the very tightest image focus (what horn does? ), but show in and show out it is among my favorites. Another Best of Show contender. The $30k Gauder Akustik RC-7 multiway floorstander sounded Best of Show-worthy driven by fabulous Vitus electronics (sensational on Jaco and Lennie). The Maggie 20.7, driven by BHK, didn’t have quite the dynamic liveliness or definition I'm used to from these outstanding transducers. The $33k multiway Verity Amadis S floorstander, driven by Aesthetix electronics, sounded great on digital (the Aesthetix Romulus DAC/CD player may have the warmest, darkest, most analog-like reproduction of digital I’ve heard). 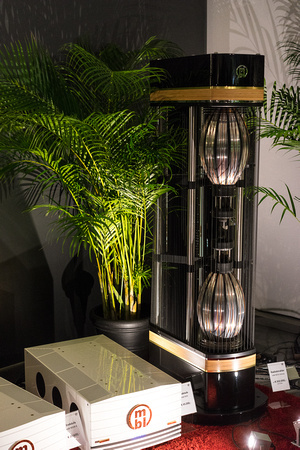 Old fave Audio Physic introduced it €5k Avanti three-way. 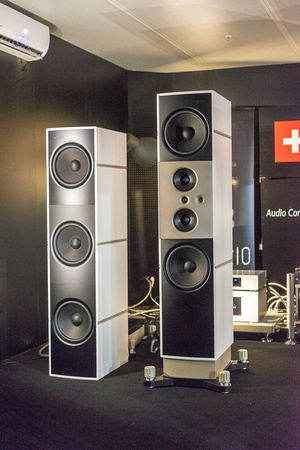 Finally, Lumen White showed its €70k White Light Anniversary ceramic-driver multiway floorstanders driven by superb Ayon tube electronics. Best of Show (price-no-object): Magico Q7 Mk II loudspeaker driven by Soulution 7 Series electronics, sourced by Soulution’s prototype turntable, cabled by Vovox, and supported by Critical Mass Maxxum equipment stands. Best of Show (for the money): Tannoy XT 8F loudspeaker driven by Rega electronics, with the Rosso Fiorentino Elba driven by Thrax runner-up. Most Significant Product Introduction: Tie among Crystal Cable CCDB subwoofer, Focal Sopra Series loudspeakers, Magico S7 loudspeaker. Most Significant Trend: Analog everywhere! Unlike AXPONA or CES, it is the rarest of rooms in Munich that isn’t equipped with a turntable, often a very elaborate one. But then, this is Germany, where the sound of music counts. Most Coveted Product: Tie between the Estelon Extreme and JBL dd6700 Everest loudspeakers. Those of you interested in seeing more photos from Munich High End, go to http://jlvalin.zenfolio.com/p622097458.